The number of bali temples is truly amazing, they're everywhere. Every village has several and every home has at least a simple house temple, there are actually more temples than home. The word for temple in Bali is Pura, which mean a space surrounded by a wall. You will find simple shrine at all unsual places, like overlooking crossroads, intersections, or dangerous curves in the road. According to they're religion, they are there to protect passers-by. Located in the middle of the village. This temple type is for the spirit which protect the village community in day in day life. The temple of the dead. Located at the end of the village on the sea side. The graveyard is also located here. The temple represent the Durga, the terrible incarnation of Shiva's wife. The destructive powers of Shiva are also honoured here. Besides of this tree basic temple, there are many more temples in Bali to serve any faith. They are also temples dedicated to the spirits of irrigated agriculture. Certain special temples are so important that they are owned by the whole island rather than by individual village. •	Pura Taman Ayun, or the beautiful temple garden in Mengwi. And on the slope of Mount Agung there is another beautiful place called Tirta Gangga, the water palace. It's worth of visiting. Bali temples usually consist of series of courtyards entered from the sea side. In a large temple the outer gateway will generally be a candi bentar, modelled on the Hindu temples of Java. These gateways resemble a tower cut in halves and moved apart, hence the name "Split gate"
The first courtyard is used for less important ceremonies, preparing food, holding meetings and will have a number of opensided shelters. The innermost and holiest courtyard is entered by another candi-like gateway except here there is a passage through the middle of it which symbolies the holy mountain through which you must pass to enter the inner court. This gateway will be flanked by statues of guardian figures or by a small protective shrines. Most of small temple may have just two courts. you can enter the temples, anytime you like except on rare occasions, but there are a couple of rules for visiting. 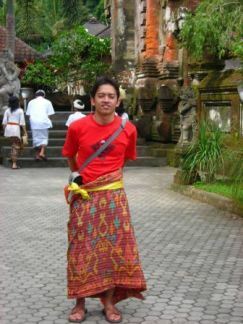 You have to dressed politely and always wear bali sarong, a temple scarf- a sash tied loosely around your waist. You can rent them around the temples or buy one for yourself if you're intend to visit many temples and it's a nice thing to have when visiting temples where sashes are not available. Almost every temple ask an entry charge. For much of the year Balinese temples are deserted, empty spaces. But on holy days the temples come alive with days of activity and nights with dance and drama. Temple festivals are as much a social occasion as religious one. Cookfights are a regular part of temple ceremonies, a combination of excitement, sport and gambling. With this occasion, women bring also beautifully arranged offerings of foods, fruit and flowers which they carry on their heads to the temple. Or would you like to review first the article that the owner of this site Kevin Butters has been written on this site, just click here to read them.